If you’re trying to nurture a new skill in a child I think you should always take your cue from them. Think about what they love and enjoy and use this as the medium to teach the lesson. Little currently adores ducks. She got a little yellow duck in a party loot bag which is accompanying her everywhere – and she quite likes ‘being’ a duck herself. She’s also very interested in numbers – a skill which I’m keen for her to practise. Today she wanted to do some painting so, to encourage those numbers, we decided to make a duck number line. I’ve blogged about number lines before and I think they’re a really useful way to incorporate written numbers into your child’s environment. Ours is strung along the kitchen window – a prominent position so Little is often looking at it. We refer to it most days, for example when we’re counting out spoons to set the table, so we’re gently reinforcing the number progression and linking the physical number of spoons with the written number symbols on the line. Of course, once things have been on display for a while they become a little stale and you walk past without noticing so I like to change the pictures on the number line to keep it interesting for Little. We’ve previously done ladybirds, autumn leaves and Christmas trees. 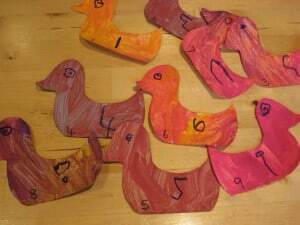 To make a duck number line: I cut out some duck shapes from pieces of card and Little set about paining them. Let you child be creative here and paint them any colour they like. Little was quite clear that she wanted pink and yellow ducks – so who am I to argue! Holding the paintbrush is good motor skill practice and the mark-making aspect paves the way for later writing. You can see from the vlog that she can’t resist swirling all her paints together – more experimenting. Once the ducks were dry Little added eyes and numbers using a felt pen. She was determined to write the numbers herself so I encouraged her to have a try – are you impressed with how well she did them? As one reason for making the number line is to have her see the (correct) written form of the numbers I added a small (correct) version of each numeral too – careful not to make Little think that her version was in anyway not good enough. 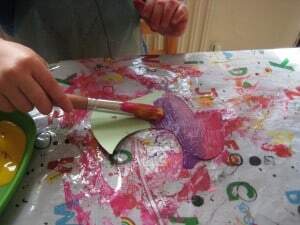 Children learn in a multi-sensory way and adding other experiences to a lesson re-inforces what you’re teaching – so why not add in some song while you’re painting and counting. Hope you like her rendition of Five Little Ducks Went Swimming One Day! We’re going to extend the play with ducks by adding them to the bathwater tonight – so Little can enjoy some small-world role play. And tomorrow we’re off to feed the ducks at the local pond – so she can learn about the real world and see some ducks in action. only 4 little ducks came back. ALL THE 5 LITTLE DUCKS CAME BACK! Awww, how adorable is she?! Well, of course I think she is! She’s a complete natural, very beautiful and an absolute artist in more ways than one. Great vlog. Keep them coming. Wow, she is just so wonderful. I think Mini may have fell in love!! Hee hee! Maybe we’ll be mothers-in-law! Mice or frogs – is that what he likes? You could sing Hickory Dockory Dock, or Three Little Speckled Frogs. Oh, that is adorable! Thanks for sharing at Memetales’ Lets Play! Pleasure Maya – great to link up with you. This is a fantastic idea! I especially love that she made the ducks! Oh, she is so lovely!!! It’s really a great and helpful piece of information. I’m happy that you just shared this useful info with us. Please keep us up to date like this. Thank you for sharing.